Security forces have apprehended five militants of Eastern Naga National Govt Group (ENNG) in Arunachal Pradesh on Tuesday, officials said on Wednesday. 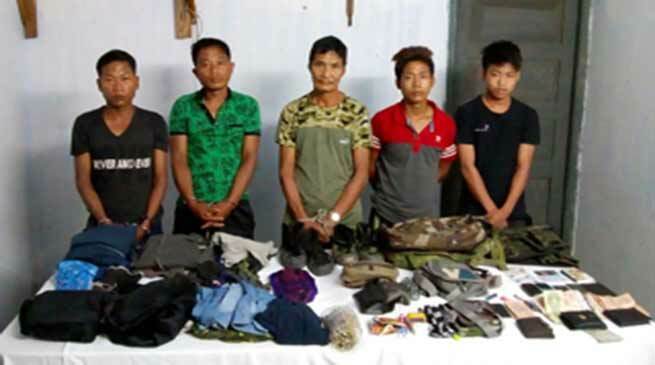 The Jairampur Battalion under the aegis of Dao Division apprehended four Eastern Naga National Govt Group (ENNG) operatives Self Styled Major Thaimong Mossang and Awang Hodung and an over ground worker during an operation in Miao town under Changlang district on Tuesday. “Acting on a specific intelligence input about militants trying to terrorize and carryout recruitment activities in Miao town, the Jairampur Battalion swiftly launched an operation and cordoned the suspected location. On being challenged the cadres tried to flee but the troops showed tremendous presence of mind and daring and chased down the militants and overpowered them,” Colonel Konwer said. Post spot interrogation all of them admitted allegiance to ENNG underground faction.